We all have good and bad days when we’re trying to improve our lifestyle. Sometimes, our bad days start to outnumber the good, but it’s important to not give up when we’re not at our best. It’s nearing the halfway point of Reddit’s 90 Days Goal, and I have been half assing it for two weeks. I’ve been bad at tracking and bad at resisting sweets; I’ve been giving in to bad moods, bad habits, and bad discipline. Halloween was last week, and that yielded a spectacular array of candies and baked goods. There have been a number of stressors that have made me justify reaching into the community chocolate bowl at the office. For me, eating one piece of candy inevitably leads to eating many more. There were days when I resisted breaking the seal, and there were days when I had easily 10 fun size candy bars. Every few days, I have said, “That’s it. That is the line. I am done.” And I work out, I watch my calories for a day, I fire up the Livestrong app on my phone. And it tends to fall apart by the middle of the next morning, when I realize I have eaten an entire 3.25-oz. bag of beef jerky that I picked up on the way to work, plus two cookies, plus my Fiber One bar and low sugar granola bar… and it is still two hours before lunch. Damn it. The hardest part of changing your life, I’ve found, is sticking to the changes. I have to remember that I can’t just take some time off from eating whatever I want to diet and get down to a certain weight; I have to watch what I eat for the rest of my life if I want my body to change. One of the best ways to prevent slipping is planning. I used to separate out individual servings of treats into bags, have a ready supply of healthy snacks on hand, and have it in my head that if I was getting fast food, I would be having a salad and a grilled chicken product. My planning has fallen by the wayside, and if I’m going to reach my goals, I’m going to have to sit down and start planning again. This means making a grocery list, separating out servings of healthy snacks to take to work or have at home, and researching better-for-me food for any restaurants I find myself visiting. I find that the latest issue of fitness magazines showing up in the mailbox do a nice job of motivating me. I let all my subscriptions lapse earlier this year, but I got re-signed-up for one of them when I participated in the Komen walk last month. So now, “Self” shows up in my mailbox again. It was the magazine that prompted me to take part in my first serious fitness effort in 2006, so it holds a special place in my heart, even if the exercises and diet were usually not up my alley, especially after I hurt my shoulder; they feature lots of exercises that could stress my bad joints and past injuries, and during my vegetarian years, I would page past the meat-centric meals. However, seeing all the exercises and workouts usually get me thinking about what ways I could get moving again when I wasn’t on a workout plan. When I was exercising regularly, they made me feel like a part of a greater community of people trying to improve their health and fitness. Yesterday afternoon, I got fed up with being too tired from overtime, being sick, and dodging the curveballs of life to give myself the care I know I need. When I got home from another day at the office, I logged into Livestrong’s main website and tracked all my calories for the day (work candy included, as brutal honesty is a good thing for me), did my physical therapy workout, and weighed myself. Today, I behaved well for breakfast and lunch, took the dogs for a walk in this gorgeous early November weather, and did another half hour of walking by myself. After I get cleaned up, I’m going to the grocery with my healthy foods shopping list to stock up for the week. And I have two issues of “Self” to thumb through before I leave them in the gym in my office building for other exercise enthusiasts to read. 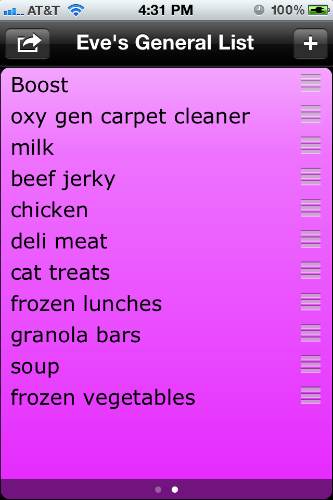 Shopping list for better calorie control (the bonus items are to cope with the vagaries of cat ownership). I have not been at my best lately, but I will do my best to keep trying even after I’ve faltered. This entry was posted in food and tagged food, habit, mood, motivation. Bookmark the permalink.